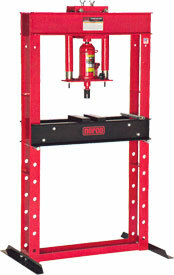 A heavy-duty professional quality floor jack designed for a variety of automotive shop uses including the day-to-day rigors of the tire changing industry. 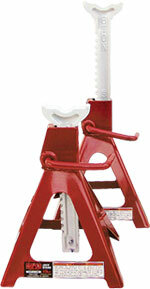 Fast acting pump raises jack to maximum height in 10-1/2 incremental pump strokes. Not only lifts fast to the load but lifts load fast. Angular pump piston provides efficient stroke no matter how far under the vehicle the jack is positioned. Nylon front and rear wheels to protect sealed floor surfaces and dealer showrooms. Thick steel side plates provide increased frame strength. U.S. Patent No. 5180131 spring loaded pawl provides constant locking pressure against lifting column. Straightening, bending and pressing. Removing and installing gears, and bearings. Manual pump power unit with “Parkerized” pump piston, ram and extension screw to inhibit rust from entering the hydraulic system. Pair of bed plates included. Shielded heavy-duty ram return springs. Power unit is bearing mounted for horizontal movement on head channel. Zero distortion, heavy-duty structural steel frame bushings. 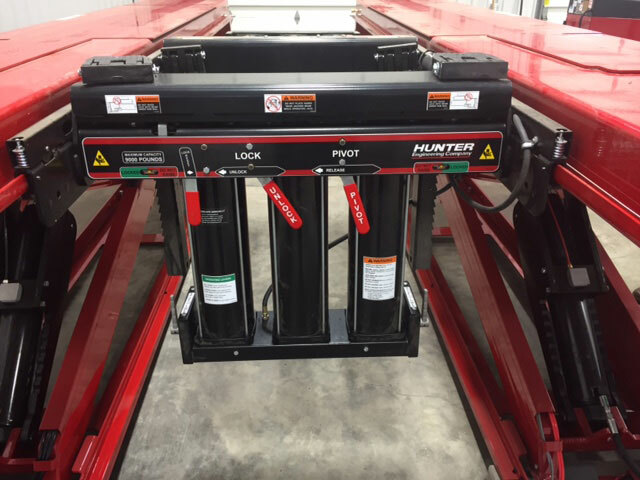 Hunter’s Rolling Swing Air Jacks add capabilities for lifting vehicles off the runways during alignment procedures and other multi-service operations. Proven over decades of use, swing air jacks are engineered to handle a wide variety of vehicles and provide easy, low-maintenance service.